What is Blue Carbon ? Blue carbon is the carbon captured by ocean and coastal ecosystems. Mangroves, tidal marshes, and seagrass meadows store this carbon as biomass or in sediments. Coastal ecosystems’ contribution to carbon in ocean sediments. How much of the carbon in seagrass meadows is stored in soil. Depth of carbon-containing biomass under some coastal ecosystems. 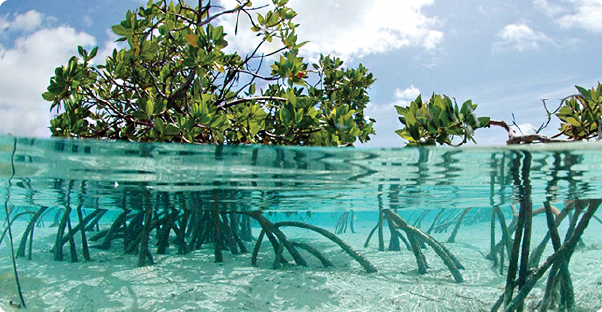 How much lost mangroves contribute to carbon emissions from deforestation. Information on this page is from Nature Conservancy and the Blue Carbon Initiative.